Our son’s first ride with a GoPro Hero 4 Black. Our son LOVES to be on camera and to ride his bike, so why not mix the two? We ride bikes to school every morning. I think in the short .5 mile ride he is learning how to safely ride with obstacles. Having to go around walkers and to watch for cars turning into driveways and whatnot. I ordered the GoPro brand handlebar mount from Amazon for $14 and was disappointed to see it’s made of plastic. As you can see it slipped during the ride, but I was able to tighten it up enough. His crossbar on the handlebars of his MiraCo BMX bike is 3/4″ so with a little piece of rubber it’s almost all the way clamped. I suppose if you needed to go smaller you could use more rubber. However, it works on my 1 3/8″ downtube without any rubber and hasn’t slipped yet. 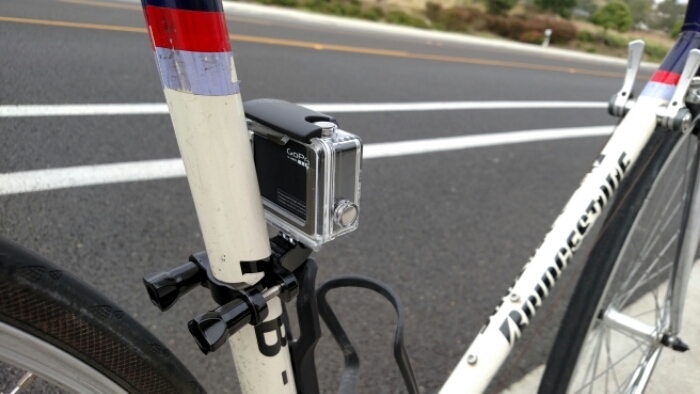 I may machine myself a similar mount out of aluminum but there is a company called K Edge that makes mounts that clamp to 31.8mm road or mountain bars that is made in the USA, anodized black, red or grey for 40 bones! It would cost that to get material, program a CNC mill, buy hardware and it still wouldn’t be anodized so I’ll probably just get the K Edge mount for my bike. We are definitely looking forward to having a lot more fun with our GoPro mount and it seems well worth the $14 on Amazon! 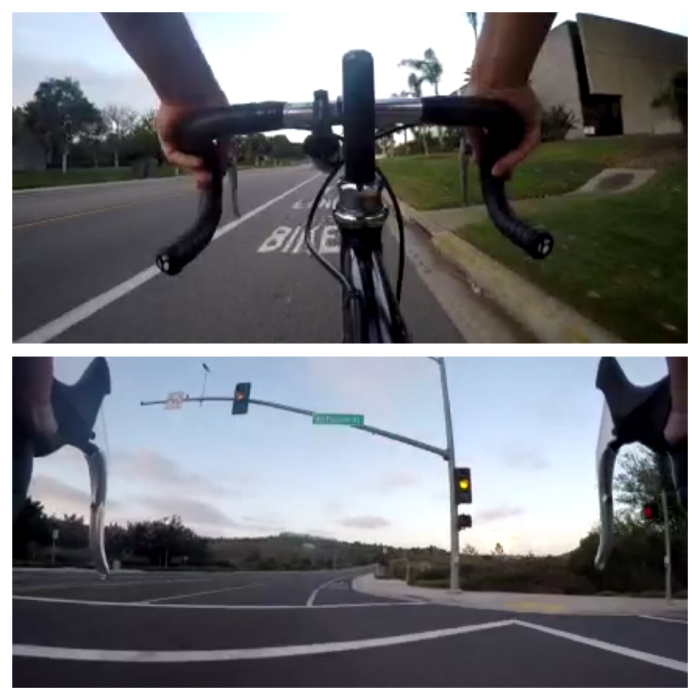 Here is a link to my first GoPro Ride. On the ride home I tried more things. Top pic is mounted on the Top Tube and the bottom pic is mounted on the head tub .